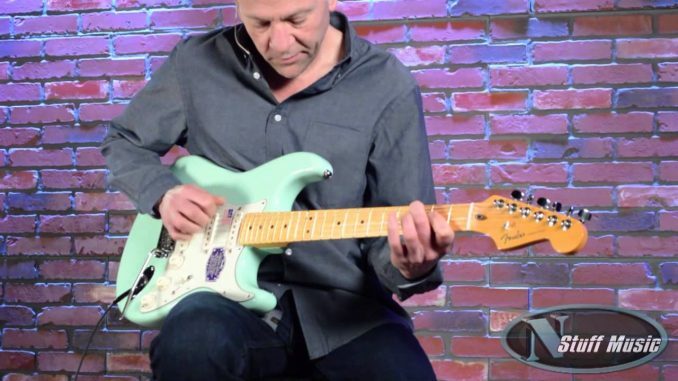 On the 60th Anniversary of the Stratocaster Fender is shipping exciting new products like the $400 street-price Vaporizer Amp a retro space age amp from the 50s. By Stephen Pate – Fender built their business as much on low-priced and powerful guitar amplifiers as they did on the Telecaster/Stratocaster guitars. is a fun 12 watt tube amp with a real 50s/60s retro look and an amazing amount of tone. Using one of these may get you more attention than you can handle. Before you tickle your funny bone with the Fender video, check out the NStuff Music which is all product and no hype. is part of the under $500 Fender Pawn Shop Special amps, amps priced so you can get lots of amp at a used am price. Adding to the same line as the Ramparte and Excelsior, the Vaporizer has its own unique clean sound and a power Vaporizer setting that bypasses all the controls for a big guitar amp sound. In case you think the Pawn Shop Special Amps are toys for little boys, Mike Campbell of Tom Petty and the Heartbreakers uses an Excelsior on stage. Mike likes to click in the Green Meanie pedal that drives his solos through the Excelsior. 12 watts into 2 x 10&Prime speakers means you can use this puppy for small gigs, along with the studio and home jam application. has a Jetson 50′s retro look in 3 colors, blue, red and an awesome Surf Green to match the Stratocaster Surf Green, I just picked up just like Mark from NStuff. So Retro it makes a different statement from another Tweed or Blackface. who I like for their generous customer service policies. yet but I think you can tell it's pretty cool and reasonably priced. Fender's Vaporizer amp evokes the 1950s-'60 sage of the Space Race, when the atom-age world became enthralled with spaceflight and spacecraft. When the wild flights of fancy it launched permeated culture everywhere from film and television to cars, guitars, appliances and more-everything was bright, colorful and flashy. Garage bands blasted off with guitar music, and legions of musicians who couldn't swing pro gear bashed away on department-store guitars and amps. The Vaporizer amp blasts you like a ray gun back to that exciting era. Affordable and out of this world, it would've been right at home aboard a Mercury capsule and down in the backyard fallout shelter. It would've been stumbled on decades later in some pawn shop corner by an unconventional guitarist with an ear for the distinctive and an eye for the stylish. It's the Fender Vaporizer. Stand back! Thanks to Mark at NStuff Music for his video. Subscribe to NStuff Music videos or follow them on Facebook. Follow me on Twitter at @sdpate or on Facebook at NJN Network.